I don’t have anything more to say about this top than the first time around, really, so the pictures will do the talking. I have a feeling this top will be getting a lot of wear! The cotton knit is a souvenir from Amsterdam. The skirt dates from before my sewing years; it is one of the very rare ready-to-wear clothes I still wear, because I just love the details in it. 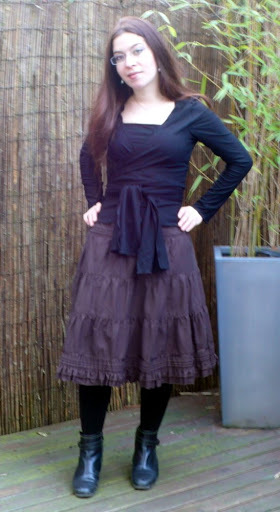 I realized this week that I could totally wear skirts despite the cold, if I layered nylon and woolen tights. So, I’ve been wearing skirts all week, and a skirt is next on my must-sew list. This skirt is just the same length as my silver lining coat, which means it acts as a petticoat under it. Let me tell you, I love the feeling! Although I always love the photos of the clothing, the view of you with your cute kitty is my favorite photo! I too could wear skirts all the time, if my job would allow it. Not so easy to do gymnastics in a skirt!! The top is very pretty. However, those skirts are back in style…boho chic, hippie power are titles I’ve seen tossed around regarding your skirt. The top is very flattering and the skirt is very stylish – keep wearing it! I love the top and made it twice last year. It’s very good with the skirt. And what a beautiful coat! Will have kept you warm in London in the snow. Very cute top, it looks great on you. I love that you have your own style and you are not bothered about what anyone says….anyway, you look fabulous. The wrap top ist so cute and the skirt is great with it. I really don’t care about fashion when it comes to skirts. I really have the feeling that skirts are classics no matter the style! You look MAHvelous! 😀 When I drop about a kazillion kilos and make it back to my ideal (pre-pregnancy) weight, I’m hiring you as my clothing consultant. Seriously! The top is beautiful Isabelle. Love your skirt too. I have a similar one but can’t wear it at the moment as the fabric is too thin to wear this time of the year. Hope you are enjoying your days in London. Your top is beautiful! I really like the wrap tops. Ce haut te va vraiment bien! Tu me donnes envie de le réaliser 🙂Ton manteau est magnifique, bravo ! I also found this winter — in Chicago — the wonder of woolen tights. The skirt and top look great! Hello my dear friend !You’re right, you look very cute in this skirt and with this lovely top. 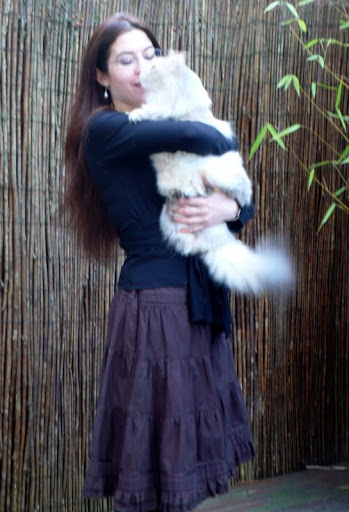 Oh, and with the cat to match, of course …You’got a little “secret garden” in your new flat ?Big hugs from France ! Cute! Obviously you and your lovely kitty are enjoying the new space you have. Beautiful top! You look great in the whole outfit and that’s fashion right there. Your coat is very nice and can will get you stylishly through many a cold winter. Coucou! !Ça y est, tu as récupéré ta minette? La quarantaine n’a pas été trop dure?Et, comme d’habitude, tes travaux d’aiguilles sont superbes! J’aime beaucoup le manteau, dans une de mes couleurs favorites en plus! !A très bientôt, n’hésite pas à venir nous faire un coucou chez les minéralettes, je crois que tu nous manques à toutes! !J’espère que tout va bien pour toi…Je pense bien à toi et te fais de gros bisous!! It’s a great top and you look SO beautiful!!! !Big kiss and hug all the way from a sunny yet cold Portugal! I have a very similar skirt, also store bought. It is now too big for me, but I plan to alter it (I hate altering) to fit. It is absolutely my favorite and I plan to make a couple in the same style for this summer! The BWOF top looks great with it. I agree with wearing what makes you feel cute and go for skirts in winter. Your wrap top is great! What a great top. I’m making a wrap top now, too. Haven’t tried the Burda version, yet. Hello my dear friend,I hope you’re having a nice week, despite the weather (pray don’t tell me you’ve got sun in London, cause here it’s rather greyish…).Big kisses and a hugh to little Miss Fluffy ! I’ve left an award for you on my blog (yes your pretty kitty is included, too!). Enjoy! Summerset beat me to it, but now you have two awards to collect. I know – you can give one to Miss Kitty for being so cute! I love the whole outfit. Great to see that you are putting on some weight at last. You look so much healthier just a bit fatter – and less tired. England must be doing you good. Je suis passée,non seulement pour admirer mais aussi pour t’inviter à venir faire la fête avec moi dès demain à la première heure :o) et tu peux amener toutes tes copines! Il y a bien longtemps que je ne suis passée te voir ..;et je vois que tu ne postes plus ! comment vas tu ? que se passe t il ? tu ne couds plus ? cela m’etonnerai fort … j’espère que ce n’est qu’un manque de temps . Bisous . un petit passage pour te souhaiter de très bonnes Fêtes de Pâques. Happy Easter Isabelle 🙂Hope things are OK for you !